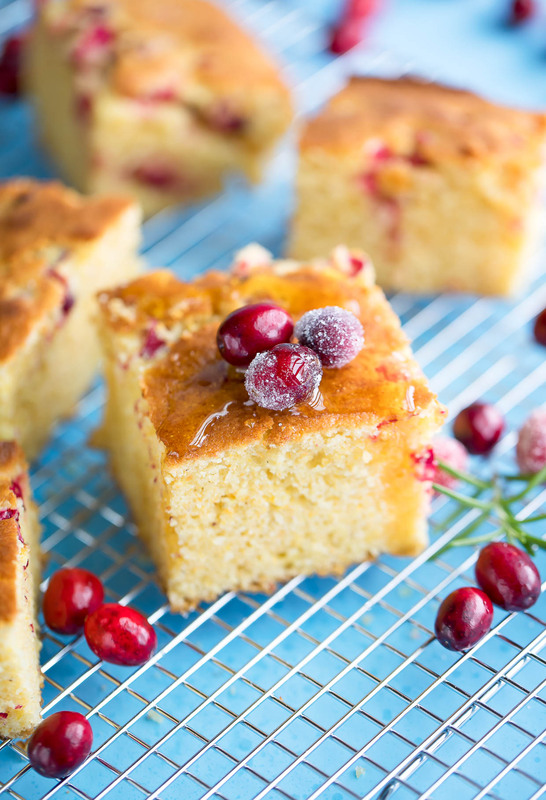 Tis the season to scarf this Cranberry Cornbread all winter long! 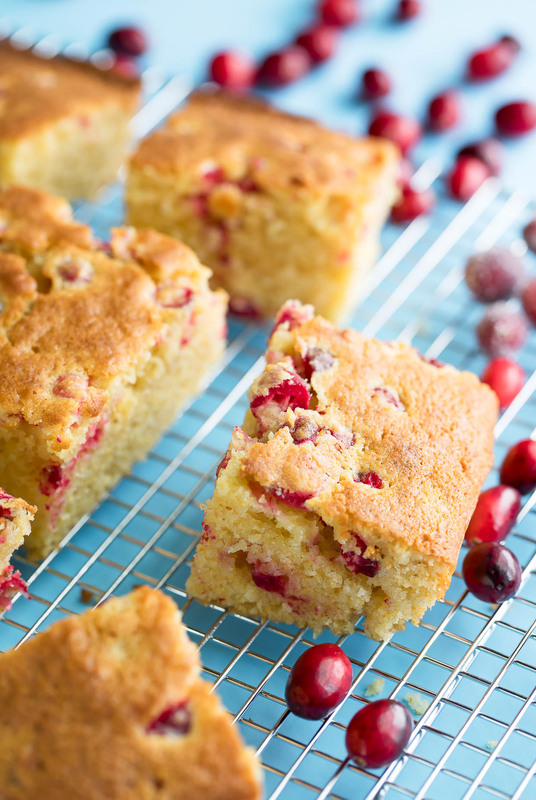 CURRENT STATUS: Blissfully typing up this recipe as fast as humanly possible while shoving the last delicious cube of cranberry cornbread into my face. Once I pick up a fresh bag of cornmeal you can bet your booty I’ll be making another batch of this deliciousness. Move over blueberry cornbread, there’s a new sheriff in town! Before I unleash any more cheesy banter on your face (forgive me!!!) let’s put a cork in it (me) and talk about this recipe! First off, I’m here to insist that this festive fruit 110% belongs in your cornbread. HOLY COW IT’S GOOD! I took my go-to easy cornbread recipe and jazzed it up with a cup of fresh chopped cranberries and a hearty sprinkling of orange zest. This time around I also used sour cream in the batter (FANTASTIC!) and a little apple cider vinegar to give my milk a buttermilk-like consistency. It’s great for giving the cornbread a bit of extra moistness and rise, making this fluffy cornbread a total treat to dive into all on its own! The sweet, fluffy cornbread paired with deliciously tart berries and that kiss of orange zest flavor… HOLD ME BACK! I love it so. Even my extremely skeptical 5-year-old found herself happily swooning with each bite. The fresh berries get hot and tender when baked in to the bread and add this refreshing burst of flavor in each bite. It almost tastes like you’re slathering the cornbread with cranberry sauce. So. Much. Yes. Snag an 8×8 baking dish and get ready for some Christmas cornbread! You can cut them into 9 jumbo squares of cranberry deliciousness or cut smaller squares to serve 12-15. Prep an 8x8 inch square pan by rubbing with butter or oil. Combine cornmeal, flour, baking soda, and salt in a medium bowl. Mix well and set aside. Combine sour cream, milk, and vinegar in a measuring cup or bowl. Mix and set aside. Chop cranberries; cutting each in halves or quarters. It seems a little daunting to do a whole cup but I promise it goes pretty fast and is totally worth it! Add your orange zest to the berries and set aside. In a large pot or skillet over medium-high heat, melt your butter. Once melted, remove from heat and stir in sugar. Use a metal whisk to whisk until well blended. Next, quickly add your eggs and whisk until well incorporated. Next add your cornmeal mixture and beat until very few lumps remain. Fold in cranberries and orange zest. Pour into prepared pan and bake for 40-45 minutes. Insert a toothpick in the very center to test for doneness. When it comes out clean the cornbread is ready! Leftover cornbread can absolutely be frozen for later (woot) or stored in an airtight container on the counter for up to 4 days. I like to microwave leftover cornbread for a few seconds and spread with a little bit of softened butter and a drizzle of raw honey. Warm and melty - yum! Bake times are using an aluminum 8x8 baking pan. Times will vary if a different size is used as well as if you use a glass baking dish or super dark baking pan. Adjust bake time as needed and enjoy! 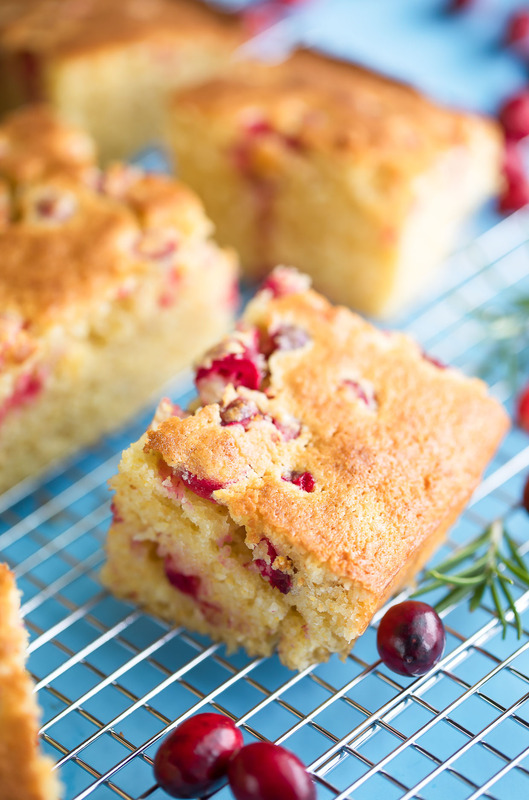 If you get a chance to try this festive cranberry cornbread recipe, let me know! Leave some love in the comment form below or tag your photos with @peasandcrayons on Instagram so I can happy dance over your creation! I can’t wait to see what you whip up! I’m super excited for you to try it Sarah! Absolutely amazing! This is probably one of my favorite recipes. 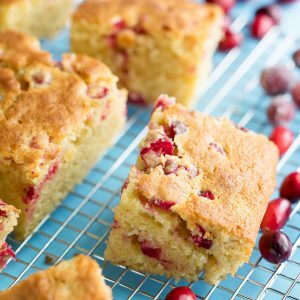 The cornbread is sweet and cakey while the cranberries add the perfect balance of tartness and crunch. Delicious!!! Sooooo stoked you enjoyed it Jen, thank you!